Just when you think you've tasted every type of booze known to man, you discover that there are yet more regionally-specific spirits being distilled in places you've never considered. Like Bolivia, for example. South America is generally rum country, but in Bolivia they make a pisco-like spirit called Singani, distilled from Muscat of Alexandria grapes grown high in the Andes mountains. Seeing that Muscat is an aromatic varietal, known for its fruity and floral character, the Singani spirit distilled from it takes on many of the perfume-like elements found in the expressive grape. The result is a clean and vibrant brandy that drinks like something in between pisco and a fruity eau-de-vie. 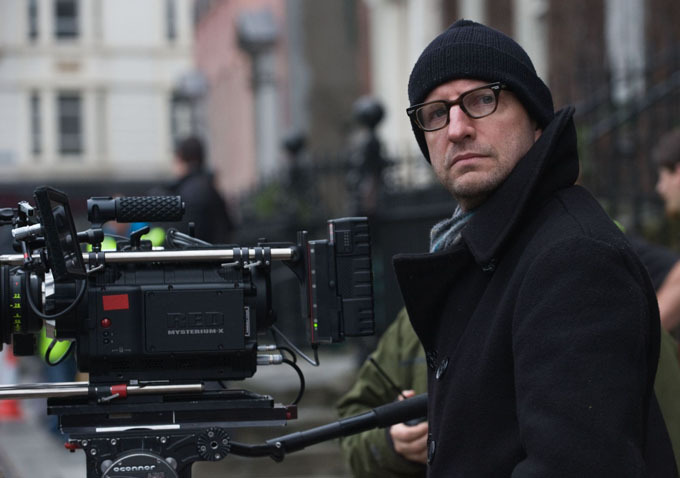 One man who had definitely never heard of Singani was Academy Award-winning director Steven Soderbergh, who happened to be in Bolivia while shooting his 2008 bio-pic about Che Guevara. He was given a bottle of the local spirit as a present while on the set, from which he poured himself a glass and was immediately smitten. He wanted to drink nothing else but Singani from that point on. The question, however, was how to get himself a bottle of Casa Real Singani after returning to the U.S.; a place where Singani wasn't readily available. Never one to be intimidated by a challenge, Steven decided to take on the task himself. He would find an importer, a brand manager, a distributor, a broker, and an entire team of professionals dedicated entirely towards providing him and his friends with the Bolivian spirit, if need be. And the fruit of that labor is finally here. Singani 63 is now at K&L: a fresh, floral, fruity spirit that brilliantly captures the essence of Muscat and mixes beautifully into a number of outstanding drinks. Just ask me—I finished an entire bottle in about 24 hours and never drank the same cocktail twice. I was so excited about my experience that I decided to get in touch with Mr. Soderbergh concerning his new Bolivian spirit, as I wanted to feature it prominently at K&L. We spoke earlier this morning about the intricate nature of the booze business and the adventures of importing liquor into the United States. David: We’ll often have customers at K&L who come in with a photo on their iPhone and say, “I had this wine in Italy last summer. It was great. Do you think you can order me a case?” They don’t understand the logistics of getting booze out of one country and into another, with all the laws and middlemen that have to be involved; all the headaches. What was your initial impression about the booze business compared to what you faced bringing Singani 63 into the U.S.? Steven: I obviously was that person you just described. I began to think, “Oh, I’ll just import Singani into the United States, no problem.” At the end of the shoot for Che so many of the crew members had gotten hooked on this stuff, it was agreed upon and assumed that I would be importing Singani to the states and we would have it on hand in a matter of months. This was obviously naïve. So then I sat down and started to map out what the realities were in terms of first creating a special label for me; that I would have the exclusive rights to sell outside of Bolivia. We got that sorted out. Then there was the issue of what to order. How many cases? I had no sense of what was appropriate or what would be needed. While having that conversation I hired a broker to navigate the world of the ATF, and the FDA, and the TTB, and that started a very lengthy bureaucratic process. They needed a sample to test it to see what was in it, and then came the classification, which sort of baffled all of us. Then a series of phone calls in which I think they were just trying to ascertain if I was who I claimed to be; was I who I said I was, and why I was doing this. David: And why were you doing it? Steven: Selfishly speaking, I wanted access to it. I didn’t want to have to email a friend in Bolivia and say, “Ship me a bottle,” which could turn out horribly. I just wanted to be able to get it and I wanted to be able to tell my friends where to get it. This process ended up taking a little over five years. To get everything cleared, filed—as you know you have to apply for everything state-by-state, which is…boring. Steven: So we started that process. Finally, two years ago we had 250 cases of this stuff show up in New Jersey. Then I had to start thinking about the realities of getting this out there. I talked to my broker and my business manager and I said, “You’ve got to hook me up with someone who can tell me how this works.” I was told I needed a brand manager, someone who brings products to market for a living. So I had a meeting with Steve Raye at Brand Action Team, and that was a very sobering three-hour meeting. If I hadn’t already had 250 cases of this stuff I might have just stopped right there. There are ways in which this is similar to the business that I am in, and there are some very significant ways in which it isn’t. David: There are laws that vary from market to market, what works in one state might not fly in another state. Steven: Exactly. The idea of clicking through, ordering online, and sending bottles anywhere—this isn’t how booze works. Steven: On the one hand, for all the bureaucracy—to its credit—it’s a very tightly regulated industry. And you know what? It should be. So the time scales were sometimes frustrating, but I get it—you can’t have this industry just doing whatever it wants. What kept me going at the end of the meeting was the knowledge of what we have. We have an interesting story. Like in my business, having a good story is very important. This is a 500 year old product that hasn’t been exposed in any meaningful way outside its country of origin. The pedigree is good and the product itself is good. Steven: There are many products out there that do very well that aren’t that good, but with clever marketing they manage to find a foothold. Steven: So we decided to treat this like an independent film. We’re going to have to zig where other people are zagging. So we started with New York, gave ourselves a time-table and a budget, and just wanted to see where it would go. Armed with a proof of concept we might be able to attract a larger distributor to eventually help. That was about a year ago. In the movie industry we would call this “forewalling,” where you rent out a theater and show your movie. So starting in January we began the New York experiment and everything started happening faster than we anticipated. David: That doesn’t surprise me. Booze is big right now and people are looking for new things. Steven: It didn’t surprise me that people responded to Singani because anytime I have a dark midnight of the soul moment about what I’ve gotten myself into, I go back to that first night at the start-up party for Che where my Bolivian casting director gave me a bottle as a present, and after drinking two glasses went back up to him and asked, “What is this? This is amazing.” I keep reminding myself, “If I feel that way, someone else can feel that way.” It’s the same approach you use when you make a movie or a TV show: you’re pleasing yourself first and you’re hoping that other people like what you like. David: That’s the best possible approach, in my experience. Steven: Soon we were able to pull in some really terrific accounts. Then this summer Steve Raye said we should send someone out West to talk about LA. I was somewhat hesitant because I was scared of our first possible setback; maybe it wouldn’t go as well as New York and I’m going to worry that the momentum’s going to stall. But we brought Lindsay Raye—Steve’s daughter—on board to work with us, and we’re now having the same success we were having in New York. Steve also felt we should capitalize on my own creative content. He said, "If you're going to keep creating this marketing stuff it would be great because no corporation would ever let anything like this through. It's too weird" He thought it was hilarious. He said, "You're not only the face of the brand, you're also the voice and it feels as if someone is talking directly to you." You know what I mean? David: Yes, of course. Everything you’re talking about represents that most important part of my job—being a direct voice to consumers that comes from a real person. It’s tough to keep that up though. Steven: Right! The key now is me being able to maintain the creative control that I’ve maintained up until now. I’m prepared to do that and keep this material ready to roll out. Luckily though, a friend did me a big favor and gave us a very prominent placing in Gone Girl, which will be out in a few weeks. He called and asked me to send him a few bottles. Then a few days later he sent me a screen grab back with a picture of Ben Affleck sitting at the kitchen table with the bottle sitting right next to him. So that was a very nice thing for David (Fincher) to do. David: That is a very nice thing for him to do. But you know I’m going to take that as a personal challenge to see who can sell more bottles of Singani: David Fincher and Ben Affleck with their movie, or K&L with the Steven Soderbergh interview. Steven: Well we’ll see (laughs). I’m not sure Ben was aware that he was about to be the Trojan Horse for Singani, but he’s about to find out. David: What is it about Singani that you like so much? Steven: Here’s the thing: I’m a professional. I like to drink and I like to try new stuff. I’m typically a vodka drinker—that’s sort of my default, my go-to. Learning about the industry, what you’re allowed to say and what you’re not allowed to say, has been very interesting. There is a grey area in terms of describing the effects that a spirit may have on you, which is what I enjoy about it. Two things struck me immediately about Singani. I took the bottle, opened it, poured it on ice and was struck by the bouquet of it, and the very subtle floral nature. The other thing I noticed was how easy it was to drink. That really surprised me. This is hard liquor. It shouldn’t go down that easily. I discovered that I could really just drink this stuff like water. David: I emptied that sample bottle you gave me in less than 24 hours. A personal record, for me. Steven: Yeah, it just goes down. What I found, and what my camera department found—we all just started drinking this stuff like crazy—was that the next day we were not hurting. Steven: That was our experience. The next morning we were fine. David: It’s so clean. There are no additives, or coloring agents, or sweeteners. It’s simply distilled from grapes. That makes sense. Steven: I’ve been lucky my whole life. Insanely lucky. Like I’ve just had weird, coincidental connections take place that mathematically were just astronomically remote. I’ve been in the right place at the right time, I’ve known the one person that I needed to know, and in this case—as we got further and further into preparation for the market—I realized how lucky I was that Singani has this amazing history, that the production is so unique. It has this very small parcel of land in the Andes where you have to use this one grape in this one region in order to call it Singani—I didn’t realize that until later researching how it was actually made. Then later, even though the TTB brandy categorization was confusing at first, it turned out to be a great category for us because there was little competition for other white spirits. David: Right, you’ve got pisco really—that’s it. Steven: If they had called it pisco I’d be going head-to-head with other marketing companies that have way more experience than I do. We’re a very unique brandy. It’s not a vodka, or a rum, or another category with tons of money and big companies going toe-to-toe. David: Well, another way in which you have a very distinct advantage is that you’re coming at this with a fun concept, while remaining focused on the historical specifics. There are so many spirits in the market today that focus only on the specifics and very little on the fun. You’re doing a very good job at keeping both at the forefront, which seems easy, but very few companies are doing it. Steven: I feel like when I look at how other people bring their products out—at the ads and the image they present of their product and what they want people to think about it—one of the things I noticed is everyone is focused on “cool” instead of “fun”. I thought this is where we are really going to zig where other people zag. I wanted to make people smile. All the materials we have are fun and put you in the frame of mind that the drink itself does—after you’ve had a couple. Plus, we’re not in a hurry. I’d rather see this happen right, than happen soon. I don’t have a timetable for this; it’s just me. David: And, trust me, customers can smell that desperation when it’s present. Steven: Right, I don’t think people like being shouted at, or pushed in a way that feels like you’re not allowing them to go at their own pace. I’m fascinated now by this whole cocktail and booze world that has exploded over the last decade of both boutique spirits and mixology. This stuff is really blowing up! David: Right, David OG and I have made our careers out of that. Steven: When I was learning to drink there wasn’t this much excitement about booze. There were the staple spirits and that was it. It’s interesting how diverse and complex this industry has become. David: So when are you going to make a documentary or a movie about booze? Steven: We did hire someone to shoot photos and videos of our last bottling run. Maybe when we do our next order I can go back to Bolivia myself and shoot some stuff. When we were there shooting Che we got to meet with Evo Morales—the president of Bolivia—who’s a fascinating guy. My goal is to go back and get a picture of me, him, and a bottle of Singani. That’s my holy grail. That would be awesome. David: So has this experience changed the way that you drink? Do you care more now about what’s in your glass? Steven: I think about it more, for sure. The best news for me is that I can get Singani now, seeing that I love it so much. It’s interesting because Che was the first time I used the special RED camera, and when I first used it I said, “This is literally the camera I’ve been waiting for my whole life.” At the same time I discovered and also felt the same about Singani. I said, “This is the drink for me. It’s exactly what I want. This is my desert island spirit and it’s just by chance that I ran into it." Now I can get it. In fact, I went to the store just a few days ago to buy more. David: To K&L in Hollywood? Steven: Yes, I said, “Give me six bottles.” Now I don’t have to have it shipped from New York. I can just go down the street. I’ve shopped at K&L for as long as it’s been around, so to be able to go into my neighborhood store and see my bottle on the shelf, that’s fantastic. It’s sort of the equivalent of seeing the poster for your movie up at a theater that you’ve gone to your whole life. That’s what it felt like. In fact, I need to go back there and take some pictures. David: Hopefully we can do more than just put it on the shelf. It really deserves a big fuss. It’s a very tasty, versatile spirit that I think has a great potential to crossover in a number of different ways. We currently have Singani 63 on the shelf in the Hollywood store and there's a huge drop on the way to NorCal for the weekend. I'm very excited to be a part of working with Steven's team and I look forward to putting the bottle in the hands of our customers. It's one of the more fun and exciting new products I've come across in some time.